The Worlds Biggest Buildathon kit will be the centerpiece of W1REX's forum at FDIM 2016. Hopefully, we will have a full house in the room and there will be 300 eager builders ALL building the WBB kit during the talk. Although the FDIM Seminars might not be streamed in 2016, I will strive to figure out a way for builders who are unable to attend FDIM, to build the WBB kit in sync with us at FDIM. It might be as simple as instant emailing, but I've been experimenting with YouTube Live and that just might be the method employed. So I offer the WBB kits to builders who want to join in the fun. Well it had to be simple as there might be as many as 300 builders in the ballroom and yet not a single soldering iron in sight. The WBB kit for FDIM will be easily assembled without a soldering iron. The WBB kit for building in QTHs around the world WILL REQUIRE a soldering iron. 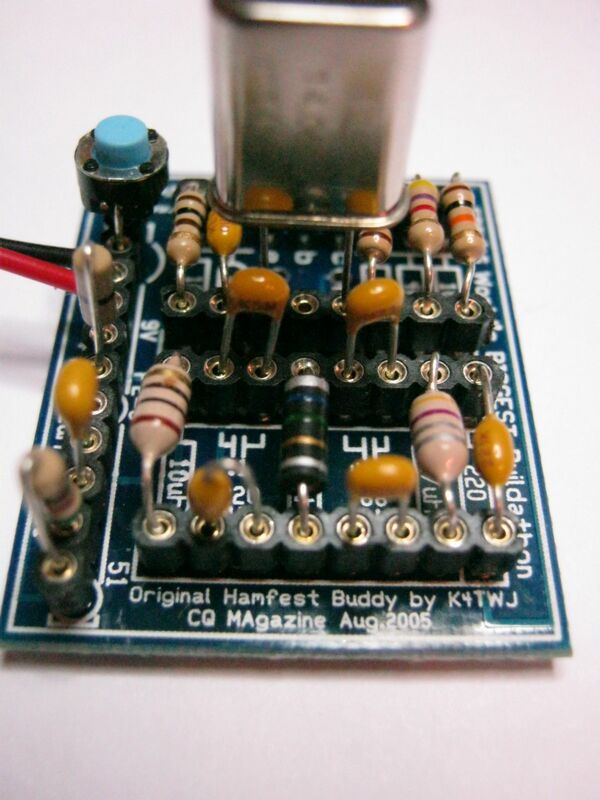 The WBB kit is an updated version of the Hamfest Buddy rig by Dave Ingram, K4TWJ. Dave introduced the simple little rig in his CQ QRP column back in August of 2005. It is a simple little one transistor transmitter with a switchable two frequency operation mode. The oscillator runs continuously but at two different output levels. On key up, the oscillator runs at very low power to use as a radiated local oscillator in an inexpensive SWL receiver close by. On key down, the output increases to a much higher level that can be picked up in receivers further away. A link to the original CQ article is listed below. 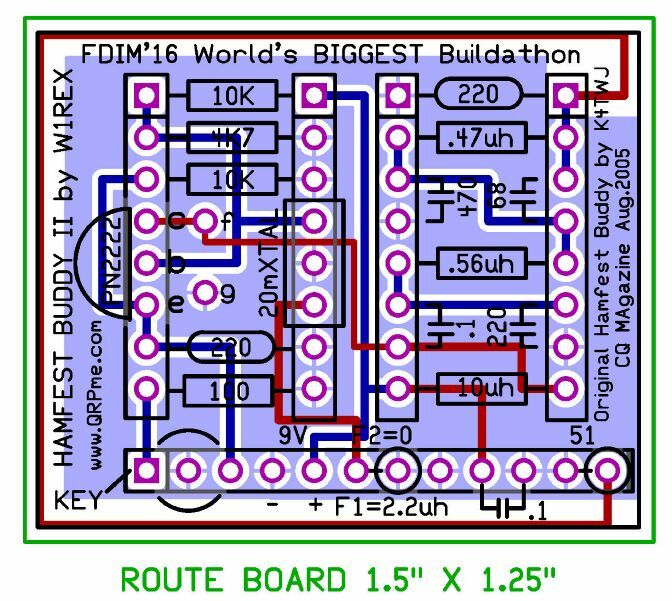 The WBB kit for the FDIM attendees will have SIP sockets pre-installed so that no soldering irons will be required. I could just see the hotel ballroom with extension cords and plug strips for 300 soldering irons!!! FDIM builders will also have plug & play parts, all pre-cut and bent for the proper socket spacing...so no tools will be required either! If the builder is all thumbs, they should bring a small pair of needle nose pliers... OR if they are resistor stripe or tiny cap lettering impaired, then they should bring their own pocket magnifier... Kits sent to QTH builders who have all their tools handy will be solder the parts in place versions.